Are you low on I/O? No problem! 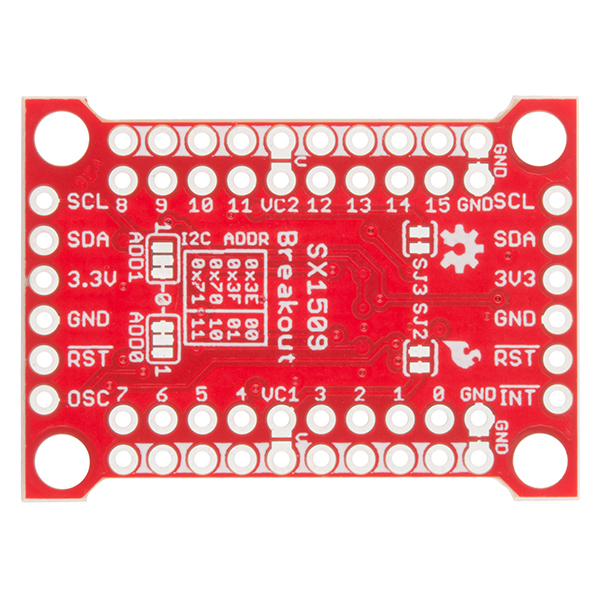 The SX1509 Breakout is a 16-channel GPIO expander with an I2C interface – that means with just two wires, your microcontroller can interface with 16 fully configurable digital input/output pins. But the SX1509 can do so much more than just simple digital pin control. It can produce PWM signals, so you can dim LEDs. It can be set to blink or even breathe pins at varying rates. 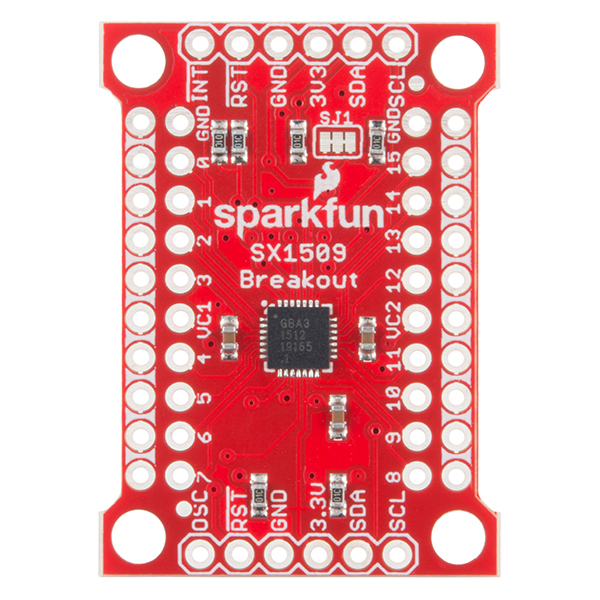 This breakout is similar to a multiplexer or "mux," in that it allows you to get more IO from less pins. And, with a built-in keypad engine, it can interface with up to 64 buttons set up in an 8x8 matrix. Since the I/O banks can operate between 1.2V and 3.6V (5.5V tolerant) independent of both the core and each other, this device can also work as a level-shifter. 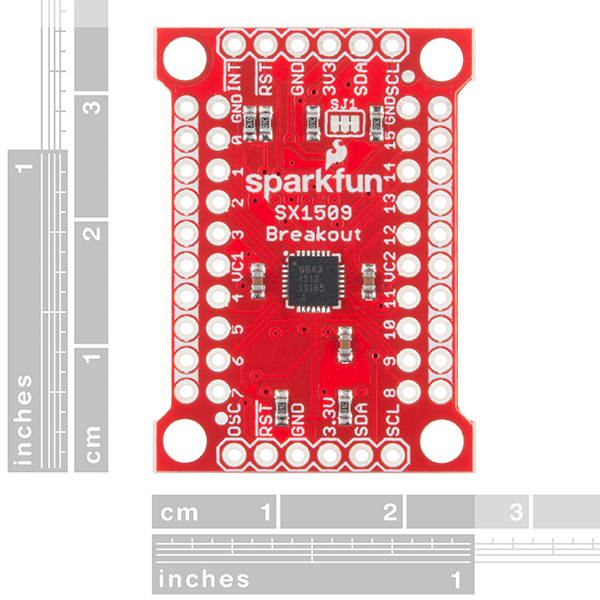 The SX1509 breakout makes it easy to prototype so you can add more I/O onto your Arduino or I/O limited controller. We've even spun up an Arduino Library to get you started! This is a great chip and board but how do you shut off a blinking or breathing pin once it starts blinking? I've not found a way. Is it possible to drive servos from the SX1509? I'm not seeing support for this in the Arduino library. Does this card have a chainable design? How many can I attach together? Does each pin have its own hardware address? I have 15 I2C-capable OLED displays all with the same hardware address and I can't spare the pins on my Arduino. Still new to all of this. If this board isn't an option, can you suggest another approach? Thank you. Oh, I see. You don't need to worry about separate hardware addresses, as the SX1509 library will handle the IO for you. What's the initial state of the I/O's on power up? Looking to use with relay boards that are active low and don't want them engaging on power up. At power-on, all I/O pins are configured as inputs. If I connect VDD (Main Supply) to 3.3v and leave VCC1 and VCC2 unconnected, will those banks be powered by VDD? Or does VDD simply power the chip, and without VCC1 or VCC2 directly pulled up to a voltage, the banks will be unpowered? If being driven by a 16Mhz Arduino Teensy, does anyone have a "good" guess about how frequently either all inputs or all outputs can be monitored or modified? I'm guessing no faster than about once a millisecond. The SX1509 goes up to 400kHz I2C rate, so you'll be more limited by the I2C bus than your MCU clock. Even though it's only 400kHz, the I2C read/write operations are quite small (Think 3-4 bytes typically). Theoretically, you should be able to do an operation every 0.1ms or less as long as conditions are good (and as long as the SX1509 can keep up - I've noticed that some operations cause a small [~1ms] delay). That said, this module also has some very useful features that let you set a PWM, Blink, or Fade effect so if you for instance need to flash an LED at 5Hz you could start it with a couple of setup commands and and stop it with another. This minimizes the total number of I2C operations required for a lot of common tasks. I have used a couple of SX1509s (with an RPi master) to control a multi-zone heating and humidification system for a reptile habitat - it worked out quite well for PWM control of the fans and heating elements. Might be nice for hard wiring, but the same length board could be had much better pin-outs for breadboard. Could have been narrower also. Does everything I expect and very helpful for adding more digital Input and output to a controller that requires more. Compact for embedding - very flexible i/o configurations open up many possibilities. Well designed. I only wish the i2c addressing was greater 4,5 even 6 bit. Works great. Library installed and worked perfectly the first time. Easy to use. The pins are clearly labeled and the tutorial explains everything with nice pictures. Easy and cheap way to expand your board for more IO ports! I was skeptical of this at first, thinking it may be overly complicated. I am happy to say my concerns were unfounded. Download the library and make minor changes to your code and everything works great! This little breakout can seem intimidating because of how versatile it is. It is actually surprisingly easy to use. 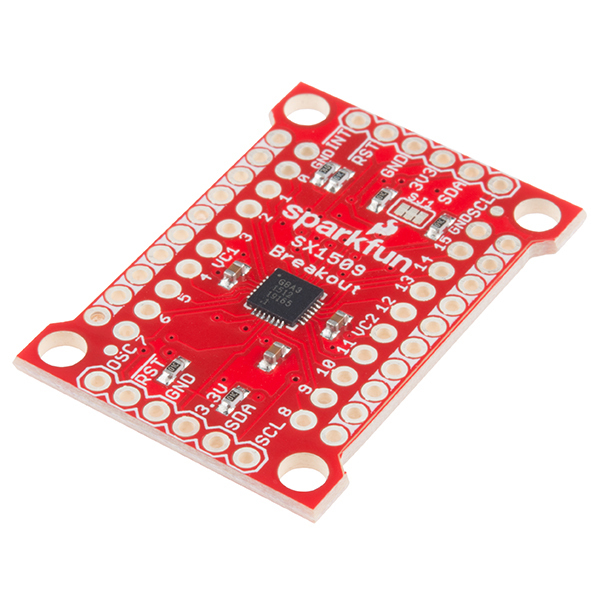 This has been the perfect addition to my ESP8266 projects. Just make sure you keep your breadboard and circuit boards in mind when soldering headers. For such a small breakout, this is a powerhouse of options. 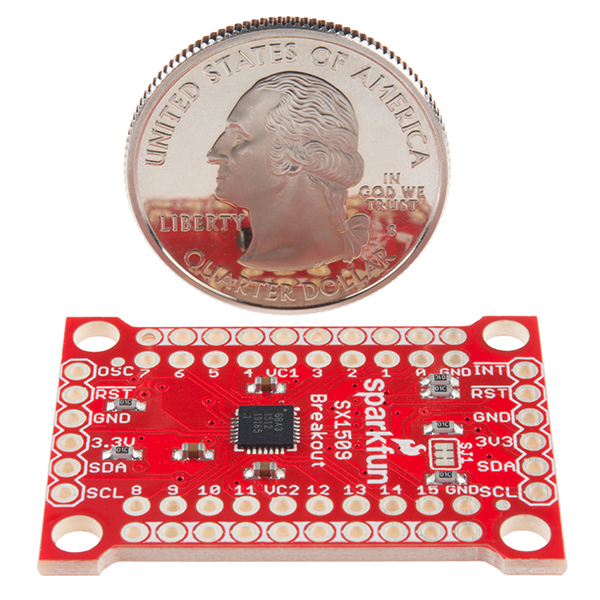 Build quality is exactly what you would expect from Sparkfun; spectacular. You won't be disappointed.